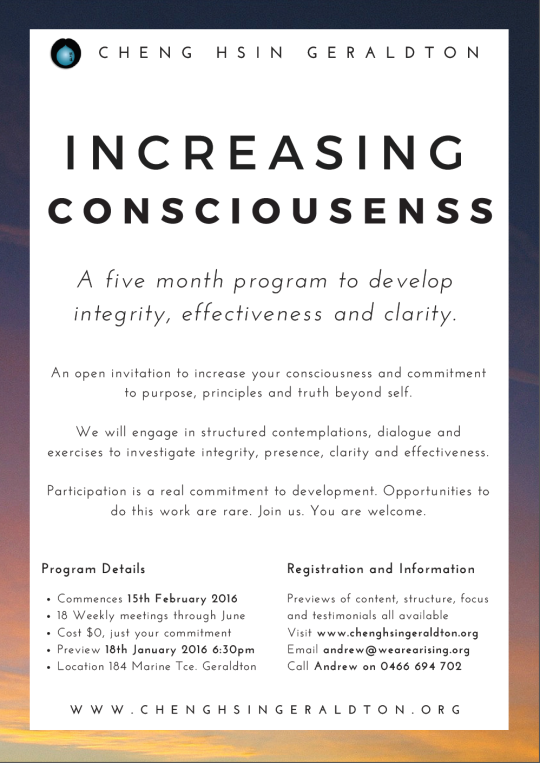 You may want to join the Increasing Consciousness group starting 15th February 2016 in Geraldton. The group will meet weekly 18 times (2 weeks break) through June 2016. The purpose of the group is about peers working together on increasing consciousness and ’self expansion’ – committing ourselves to purpose and principles that serve more than self, empowering not only the self but others and the truth as well. Through the group we can engage in dialogue, exercises, dyads, contemplations. There is a structure, manuals and exercises on topics such as effectiveness, commitment, integrity, clarity, presence and communication. I will facilitate the group guided by the Cheng Hsin founder, Peter Ralston, and other facilitators around the globe running similar courses at the same time. While we will provide the structure and guidance, each participant brings their own commitment to change. Over the last 17 years I’ve cumulatively spent 6 months in intensive retreats around the world, lead workshops on meditation and personal development, and been committed to living a life of purpose and contribution. Since 2012 I’ve been practising Cheng Hsin through retreats, online eCourses and daily practise. Cheng Hsin’s approach to increasing consciousness is grounded, direct, playful, embodied and has transformed my daily experience, relationships and effectiveness. I would love to share this work with you. Participating is a real and deep commitment to development. Opportunities to do this sort of work are rare. On 18th January I will hold a ‘preview’ session to share more about this, and you are welcome. You can download a flyer with some details, and a previous Cheng Hsin newsletter with information, questions and testimonials. There are more links about Cheng Hsin and this work at http://chenghsingeraldton.org including blogs reflecting retreats, eCourses and related experiences of this work. If you have any other questions, want to meet, chat, experience some of the work or read some of the relevant books or materials, I can help with all that.